Once Genesis 2.0 was released a few weeks ago, the countdown to a new look and feel for StudioPress.com began. The brand new StudioPress.com highlights the Genesis Framework’s design capabilities. What Brian Gardner, Rafal Tomal, and the rest of the StudioPress team did is sleek in look, responsive in feel, and revealing of the vast potential our simple yet very powerful Genesis framework possesses. Oh, and it performs … still loading in less than a second. 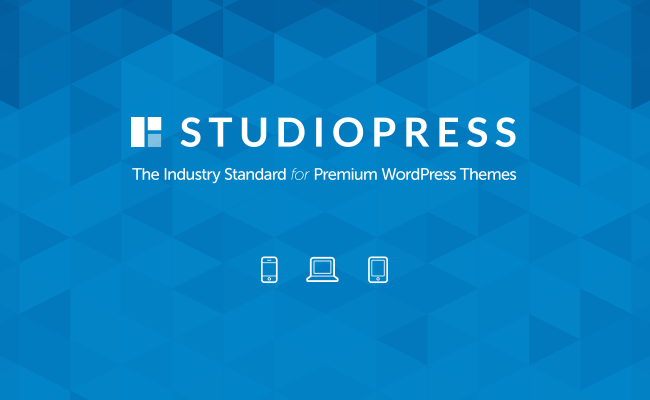 The new StudioPress.com shows you why more than 101,000 website owners have made StudioPress the industry standard for premium WordPress themes. But don’t just take my word for it. I’m biased, after all. See for yourself. With our assortment of child themes expanding — and a new Pro theme announced on the blog weekly — now is literally the best time ever to join one of the largest, most loyal contingents of WordPress publishers. We love using our own products to make our sites, and our businesses, better. But we love watching you achieve your goals even more (we are a training company, after all). And we hope the new StudioPress.com helps inspire the next step in the evolution of your website’s design. Oh yes Jerod.. I also love studio press mainly due to their extremely great SEO friendly code. Under 1 second is IMPRESSIVE! Great question! And, in fact, I’m glad you brought this up as it’s a terrific learning opportunity about what contributes to site speed. If you look at the link you posted, you can see that the waterfall shows each object being loaded on the page, where it’s coming from, and how much it is contributing to the overall load time. Notice how all of the objects loading from copyblogger.com are lightning quick? The issue here is actually objects from third-party sites. Examples include http://www.google-analytics.com/ and player.vimeo.com/v2/ and there are others. The Analytics code, in particular, isn’t even fully loading. The same is true for a video code. That causes unnecessary lag times. A clean, streamlined site with under 100 objects and a relatively small memory footprint, as Copyblogger has, should not take any longer than a second to load. And this is where it is SO important to go through themes with a fine-tooth comb and ensure that there are no unnecessary or broken links being loaded. I was just checking it out to buy for my clients’ site. And guys, you ROCK! It’s really impressive. Yeah, a completely new flavor. I like it. The new site looks great! I have purchased plenty from StudioPress in the past and excited to do so again in the future. Congrats to Brian et al. A nice website for a website that sells nice websites. Sorry, I just had to say websites three times in one sentence. I have always been very impressed with Studio Press. Looks even better now. Two thumbs up. When I checked the new design of Studiopress , I got speechless.